POLYGUARD RD-6® COATING SYSTEM is a non-shielding anti-corrosion system used on buried and submerged line pipe, rehabilitation and new construction girth welds. RD-6 can also be used above ground but the coating must be protected from harmful UV rays. RD-6 has been used on thousands of projects for over 30 years. In that time, neither external corrosion nor SCC (Stress Corrosion Cracking) have been a problem for RD-6. See the Features and Benefits list below to find out why. 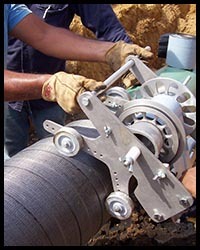 Pictured is the application of RD-6® using the wrapster, which helps provide a tight wrap around the pipe. The wrapster is available for purchase from Polyguard Products. RD-6® is a non-shielding coating. If the coating ever becomes disbonded, the pipeline is still protected because cathodic protection currents can reach the disbonded area. Once there, the current will raise the pH of the water underneath the disbonded area to 9 or higher - a level too high to support corrosion. The geotextile fabric backing of RD-6® does not shield cathodic protection currents. For more on Non-Shielding Coatings, click here. RD-6® resists disbondment from the pipe, even if surface preparation is less than perfect. For more on Surface Preparation Quality Tolerance click here. RD-6® is highly resistant to soil stress, a major cause of coating disbondment. For more on Resistance to Soil Stress click here. RD-6® application time is quicker than almost any other coating, and requires no cure. For more on Fast Installation click here. 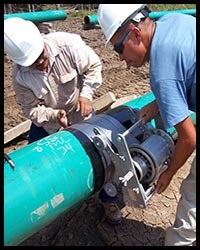 RD-6® has a long record of successful installations in the field. The first installations of RD-6® were in 1988. By 1992, the product was being widely used in North America. Today there are thousands of installations. For more on our track record click here.